Registration for Achiezer's Eldercare II conference is officially open. 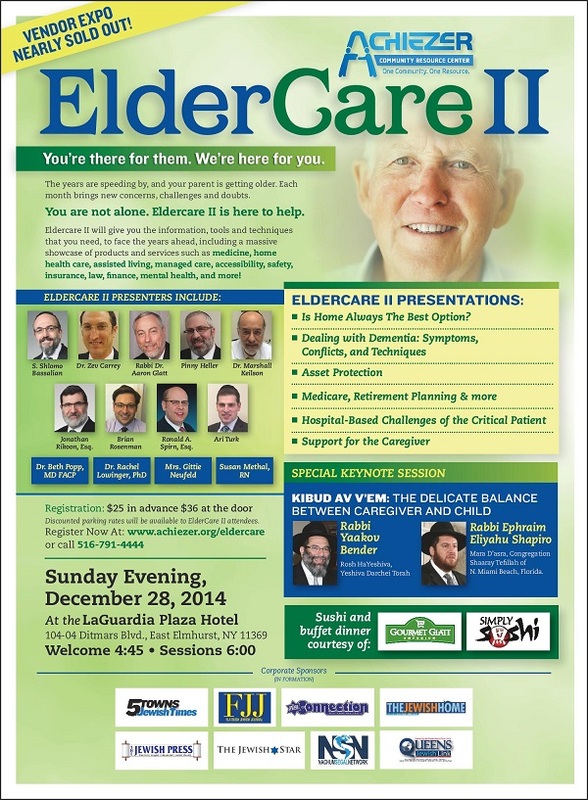 On Sunday evening December 28, 2014 Healthcare Professionals, Rabbinic Leaders and Community Organizations from across the New York area and beyond will join together at the LaGuardia Plaza Hotel for a one-stop-shop Eldercare Conference. Topics such as Finance, Elder Law, Medicaid, Medicare, Dementia, Long Term Planning, Living Arrangements and more will be presented. Caregivers will walk away with the knowledge, information and practical techniques needed to navigate the years ahead. For more information or to register click here or call (516) 791-4444. Doors open 4:45pm. Sessions begin 6:00pm. Dinner will be served. Discounted parking will be available for Eldercare II attendees.